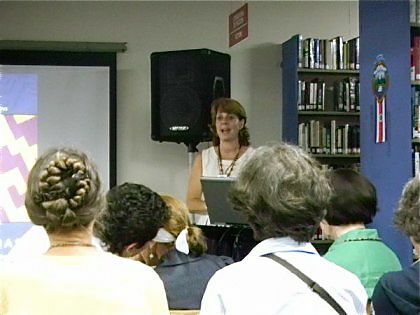 Removing the fear factor of going to an art opening or show is one of the objectives of the exhibit, Metamorphosis: a New Cycle, Silvia Piza-Tandlich, textile artist, told WCCR members and guests at the National Museum on July 29th. This very special extra club event was coordinated for members by Elena Austermuhle and Anne Kreupeling. 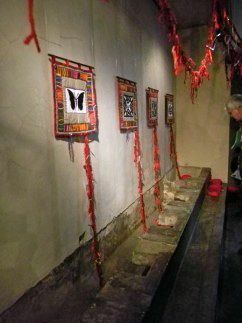 Asked how the exhibit came about, Silvia explained that she presented 28 handmade pieces originally intended for another show to convince museum personnel to let her take over the dungeons of the former fort. One of the challenges was to hang the displays without putting any new nails in the walls by using the railings already installed along the ceilings. Dealing with the dampness loomed large. By agreeing to repaint the walls in one room, Silvia was able to paint it a wine color so her white textiles would stand out. A variety of creative textiles and mixed media are linked together by kilometers long fabric rope chains that signify links between artists, artists with people, and people with other people. Some pieces are quilted; others feature 3-D portions, while others appear to be woven. Some have handwritten messages on them, the narrow panels flowing down the walls and onto the floor. Other works resemble large overstuffed whimsical pin cushions. Beyond the displays and the architecture, the exhibit is tied together with music composed for the show that drifts on the air in the background. It’s amazing to contemplate that prisoners lived in the tiny windowless cells that display some of the creations. Without the help of several women and their families who create with her at the Galeria Octágono in San Rafael de Heredia, the exhibit that runs through 26 September would have been nearly impossible to assemble. Silvia wants visitors to enjoy the exposition but most of all she doesn’t want them to be indifferent even if the art doesn’t appeal to them. She may be contacted at 2267-6325 and info@galeriaoctagono.com. Her website is www.galeriaoctagono.com . Thanks to SDA member Silvia Piza-Tandlich from Costa Rica, I learned about the non-profit textile organization Red Textil Iberoamericana, founded in 2006 in Costa Rica. Their first ever conference, First Encounter of the Iberoamerican Textile Network, was scheduled to take place in San Jose October 6-9, 2010. With an invitation for a place to stay from fellow fiber artist Sylvia Saborio, who recently moved to Costa Rica, I made plans to attend. 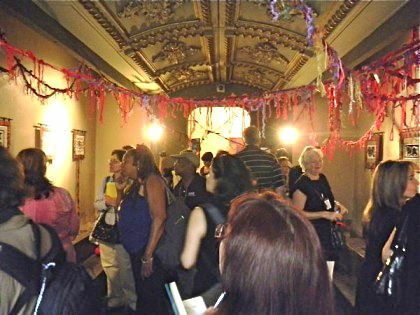 The conference offered an opportunity for fiber artists from Iberoamerican nations, the United States and Europe to come together. Costa Rica, Mexico, Argentina, Guatemala, Nicaragua, Peru, Chili, Columbia, Spain, Holland, Germany, and the USA were represented. Conference registration was held in the National Museum of Costa Rica which hosted Metamorphosis: A New Cycle, work by Silvia Piza-Tandlich and her Cerro Danta Collective. Piza-Tandlich created a metamorphosis of place by transforming the former army barracks and prison (Bellavista Barracks) into a multi-sensory environment with eleven separate areas united with knitted chains of fiber created by her community. The opening conference program at the Costa Rican-North American Cultural Center featured a surprise piano performance by the Costa Rican Minister of Culture, Manuel Obregon, who is also a professional pianist. 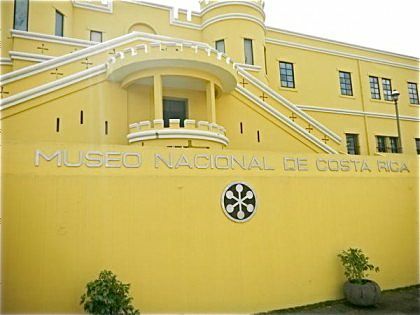 By moving the location of each morning and afternoon session to various museums and cultural centers throughout the city, we were able to experience the warm hospitality of Costa Rica and view the numerous exhibitions hosted at each center. Though the number of conference attendees was small, the program was rich with interesting and inspiring speakers. The impressive line-up included SDA members Rebecca Stevens, consulting curator at the Textile Museum, Washington, DC; Carolyn Kallenborn, University of Wisconsin; Susan Taber Avila, University of California Davis; Jessica Hemmings, Edinburgh College of Art, Scotland; Lia Cook, California College of the Arts; and Carol Westfall, retired from Montclair State University, NJ. 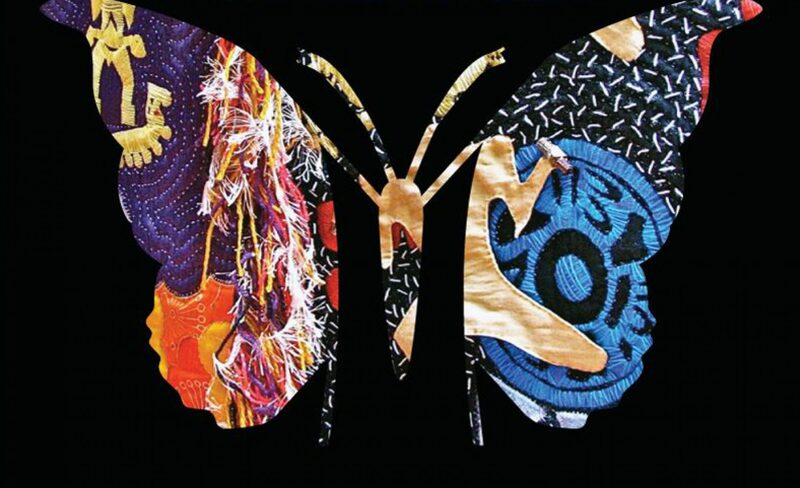 For an overview of topics discussed, go to First Encounter of the Iberoamerican Textile Network, where a digital catalogue of the Metamorphosis show can also be downloaded. 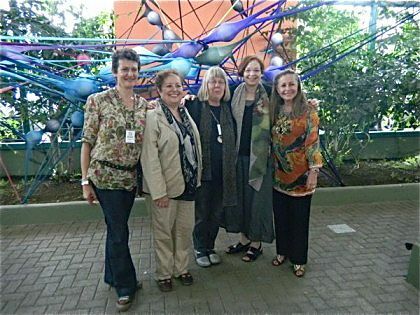 L-R: Paulina Ortiz, President, Redtextilia; Lala de Dios, President, European Textile Network and Madrid Textile Creators; Beatrijs Sterk, Secretary General, European Textile Network and Editor, Textile Forum magazine; Candace Edgerley, President, Surface Design Association; and Pilar Tobon, President, World Textile Art. 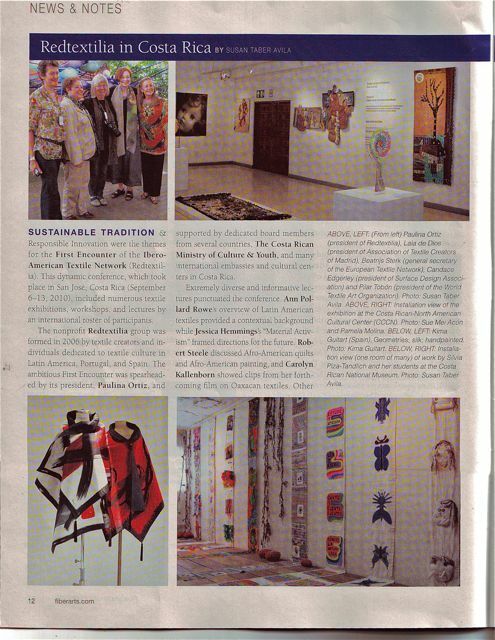 The conference provided an opportunity for Latin American fiber artists to unite and lay the groundwork for future encounters. 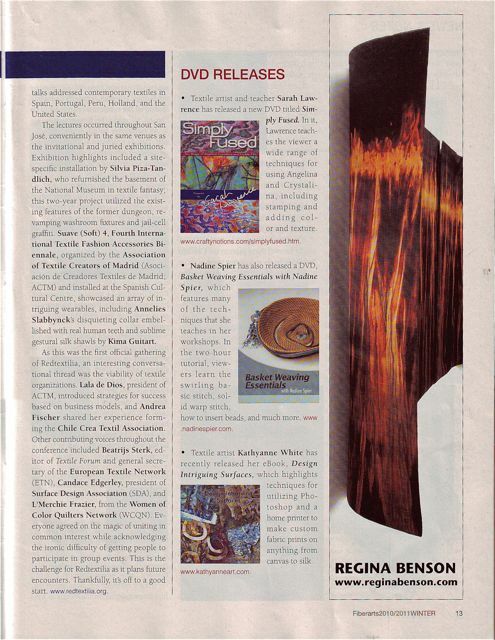 Attending gave me an opportunity to connect with artists who were not familiar with the Surface Design Association and to meet with the leaders of our sister fiber organizations. Carolyn Kallenborn spoke about the process of filming. 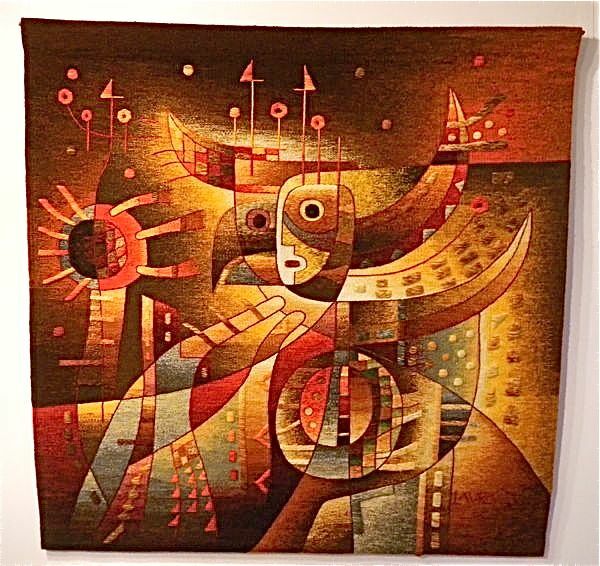 The presentation by tapestry weaver Maximo Laura of Peru introduced the audience to “Rituals & Vision: Textile Art of Peru” and the amazing work of not only Laura, but also the work of pre-Columbian and contemporary Peruvian textile artists. 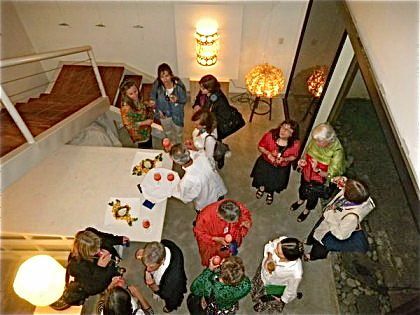 The conference participants were invited for dinner to the studio and home of conference organizer Paulina Ortiz. Optional post-conference tours to the Cartago Municipal Museum, Orosi Valley, Cartago (Costa Rica); the Boruca Indigenous Reserve (Southern Costa Rica); or to the Guna Indigenous Reserve on the San Blas Archipelago (Panama) were available for further exploration of the region and culture. *SDA President Candace Edgerley is an artist and educator who lives in Alexandria, VA. She designs wall pieces, clothing and accessories under the label Ginkgo Designs by Candace and teaches surface design for textiles at the Corcoran College of Art + Design in Washington, DC.